Engine: 1988 Ford Mustang GT302ci (5.0). (I found one that only had about 20,000 miles on the odometer.) Weiand aluminum intake. Holley 600cfm carburetor. 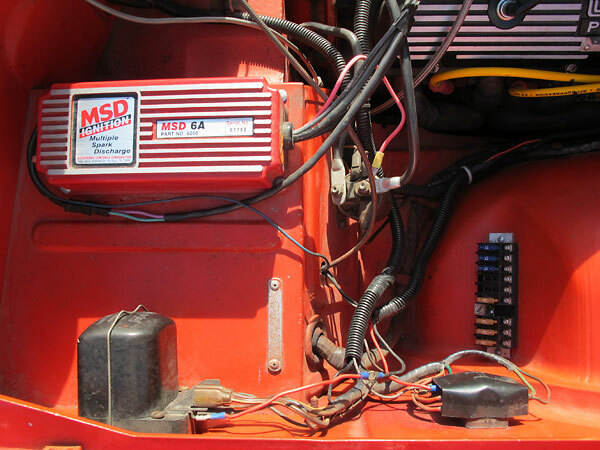 MSD6A capacitive discharge ignition. Accel 8.8 Silicone Plus spark plug wires. 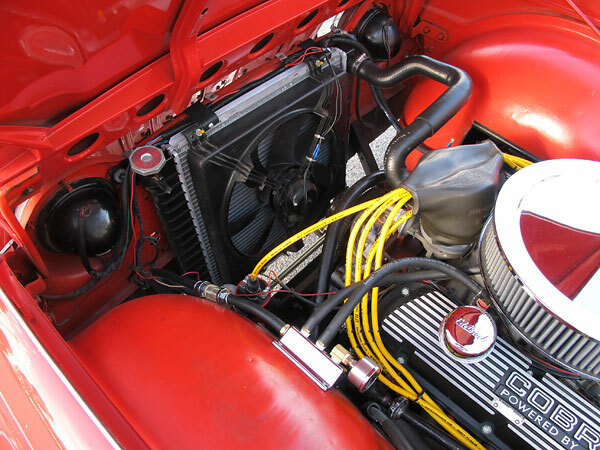 125Hp NOS nitrous system. Cooling: Radiator is from a Bronco. Water pump is aluminum Weiand. Fan is a GM electric, in a puller arrangement. Exhaust: Summit block hugger headers. 2" generic turbo mufflers. No crossover pipe yet. Transmission: Ford T5. Converted from a hydraulic to a cable clutch. 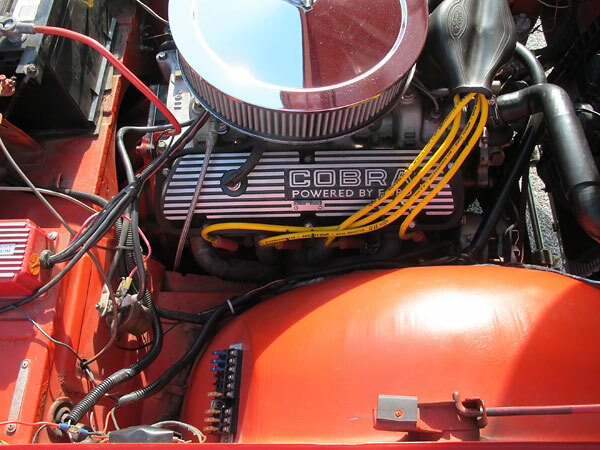 The cable is from a 1976 Mustang Cobra (new). 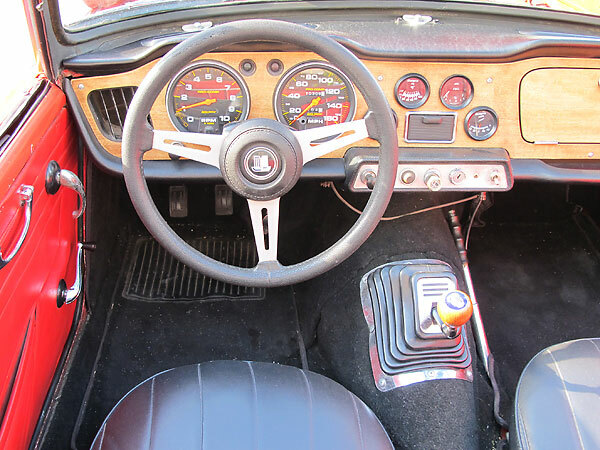 The cable connects to the pedal via the original lever for the clutch M/C. Looks kinda hokey but it has worked fine for 6 years. 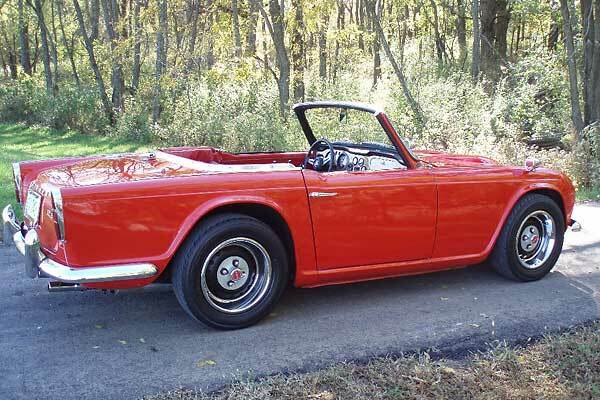 Rear axle: Stock TR4 for now, with a limited-slip Ford awaiting installation. Frame: Cross-members were modified/relocated for the engine and transmission. Suspension: Stock except for stiffer springs and shocks in front. Brakes: Toyota 4-pot calipers in front. Stock rear. 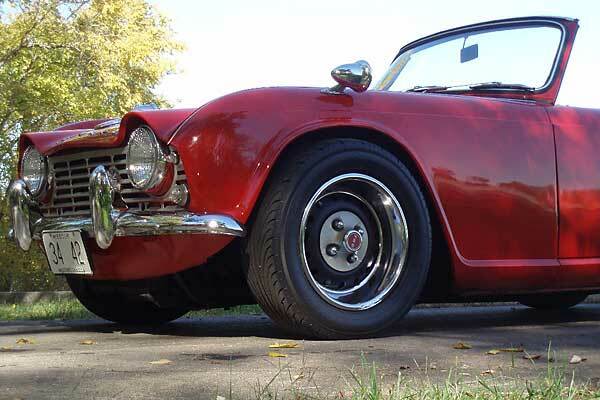 Wheels/Tires: Triumph TR6 steel disc 15X6 wheels. 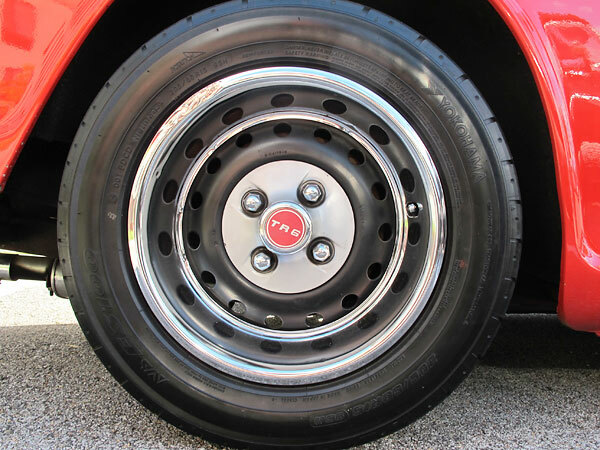 Yokohama AVS ES100 205/60R15 tires. Body: Stock (a requirement of the conversion was that the body must appear stock). 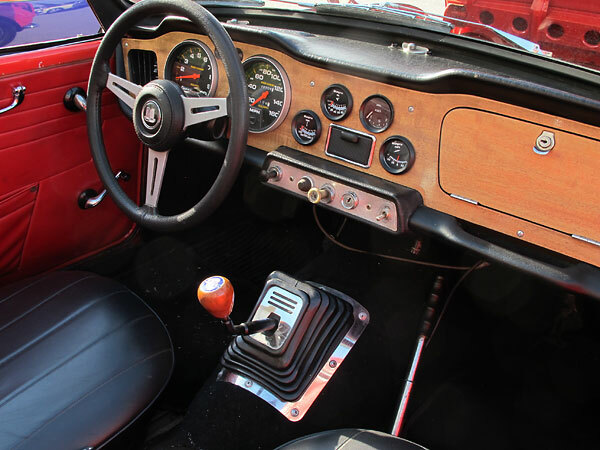 Electrical: Autometer Pro-Comp gauges. Suburu 100-amp 1-wire alternator. Ford starter. Completion: July 1996 at a cost of $2,500. Miles Driven: Driven over 6000miles (as of September 2002). Performance: Best 1/4 mile performance - 13.7s@105mph. I've driven it to 124mph and it was still pulling. Jay's Comments: If you are thinking about doing a conversion, then do it. You won't be disappointed. 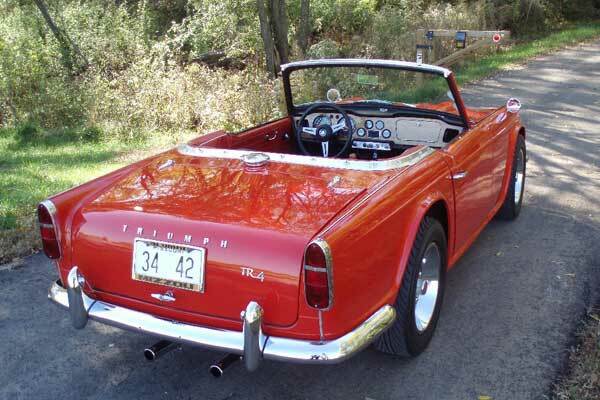 A car that looks as good as a TR4 deserves an engine of equal caliber. 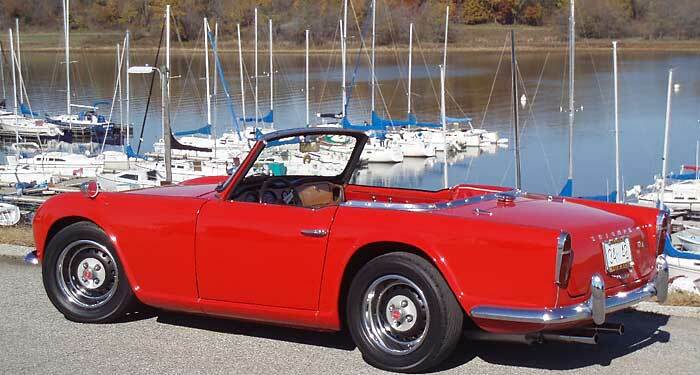 I started working on the conversion of my TR4 in January 1996 and finished in July. I've been driving it with gusto ever since! The conversion seemed to go in spurts as time would allow, but the entire process took about 6 months. 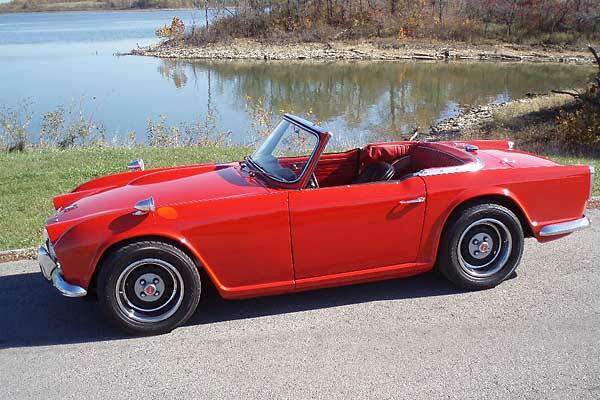 This project was truly the epitome of a low-buck conversion. I tried to find as many parts as possible at the local junkyard to hold costs down. 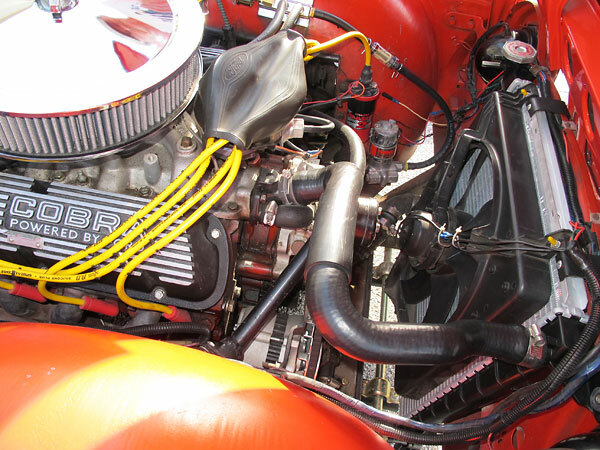 The engine is a stock 1988 5.0L from a Mustang GT that had only 20,000 miles on the odometer. The 5.0L motor actually fits in the engine bay quite nicely and I found it weighed only slightly more than the original four-banger. This means the weight distribution is still good. The worst part of the conversion was figuring out the steering and exhaust. 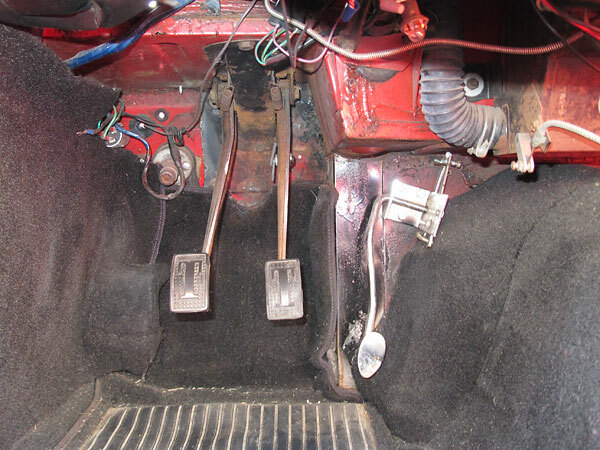 The steering column had to be re-routed to make it around the wider V8. Also, the new motor was slightly longer and the steering rack was in the way. Instead of chopping up the firewall, I decided to relocate the steering rack by moving it a few inches forward. This of course led to a series of problems of poor steering and lots of bump-steer. I had counted on this, it just took longer to sort it out than I originally thought. Finally, after several trial and error sessions, I got the steering worked out. I also put new bushings in and replaced the stock front springs/shocks with high-performance ones. 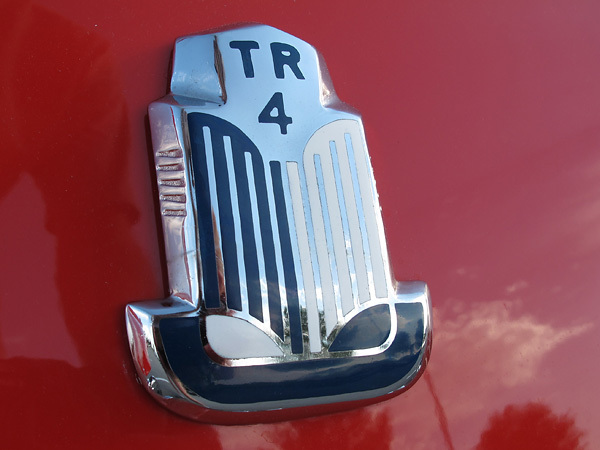 The transmission is a T-5 5 speed, but the rear-end is the stock single-trac as of right now. (I have a limited-slip Ford I can drop in when the original one dies.) 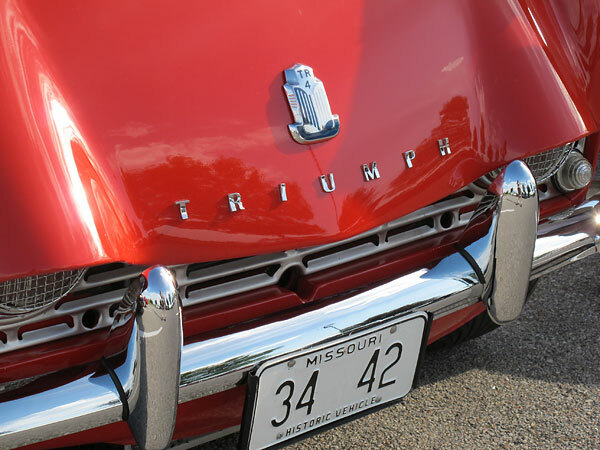 The original rear-end has held up so long because I am unable to transmit all the power to the pavement. Push the 'loud' pedal too much and the right rear tire goes up in smoke. This hasn't really been a problem since I drive the car on the street much more than the drag-strip. The car is now an absolute ball to drive! 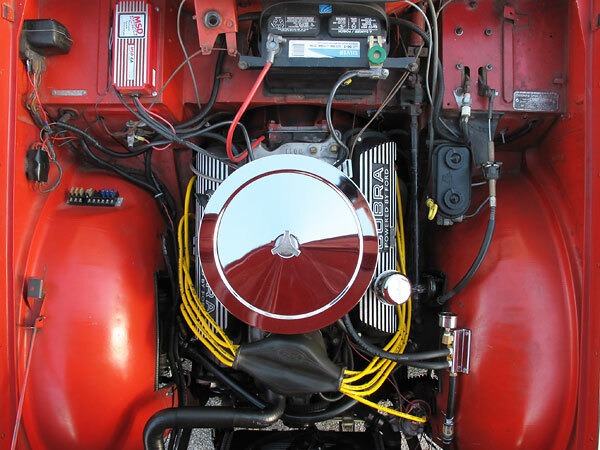 It handles extremely well with an abundance of torque and horsepower. It has run a best of 13.7 @ 105mph in the 1/4 mile (while spinning one tire a good distance down the track.) I really need that other rear-end installed to have a chance of making a low 13-second (or better) pass. 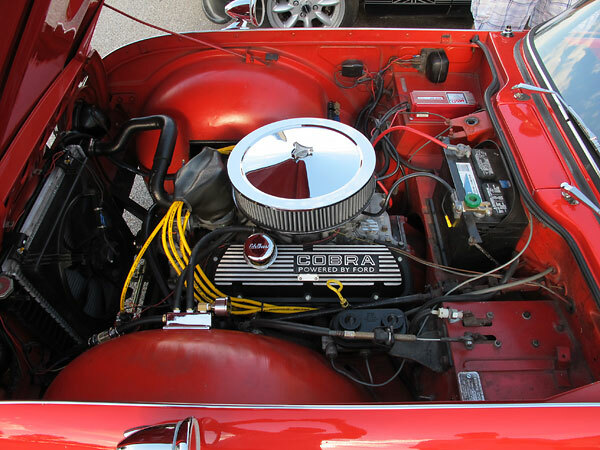 The car is also equipped with a 125hp Nitrous System. I haven't tried this at the track yet because I am unable to use it until the middle of third gear. It does, however, make another good conversation piece. Things I would do different next time? Something I hope to do in the near future is re-route the exhaust through the frame to eliminate clearance problems. 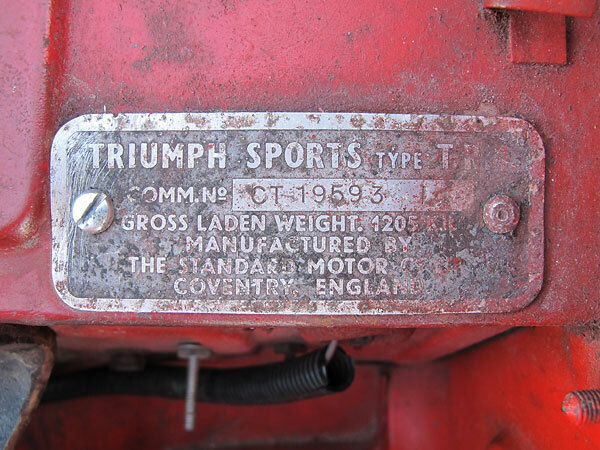 The Ford 302 V8 sits very low in the Triumph chassis. 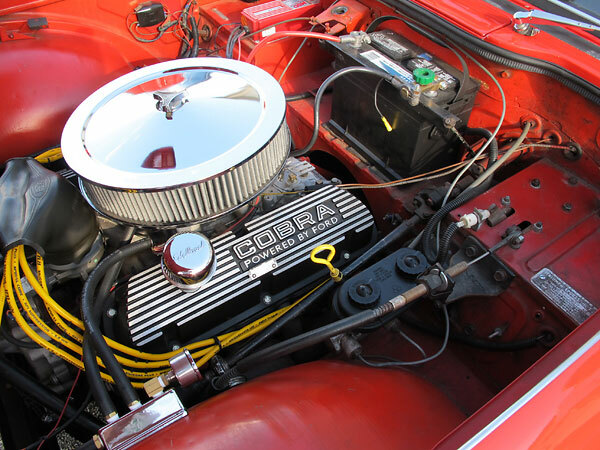 Converted from hydraulic to cable clutch actuation with a (new) 1976 Mustang Cobra cable. 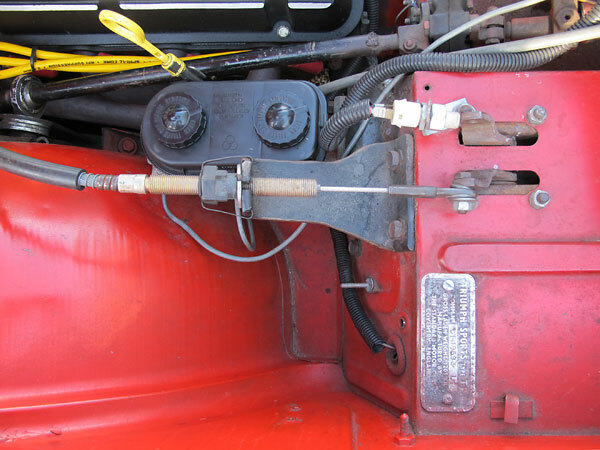 The cable connects to the pedal via the original lever for the clutch master cylinder. Radiator is from a Bronco. Fan is a GM electric, in a puller arrangement. 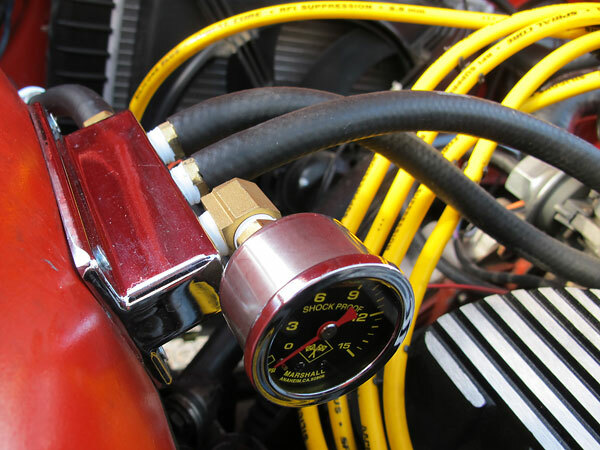 Marshall Shock Proof fuel pressure gauge (0-15psi). Accel 8.8 Silicone Plus spark plug wires. Enjoying this article? 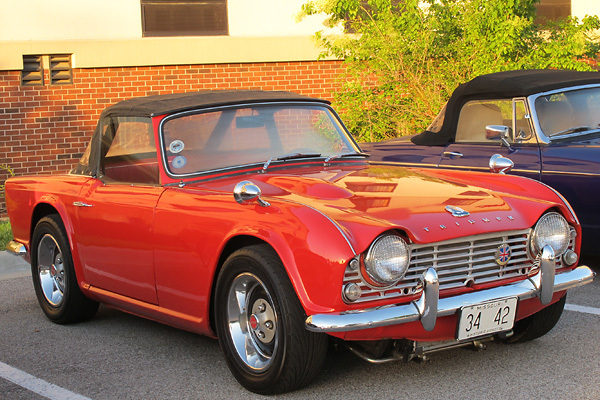 www.BritishV8.org is partially funded through generous support from readers like you! 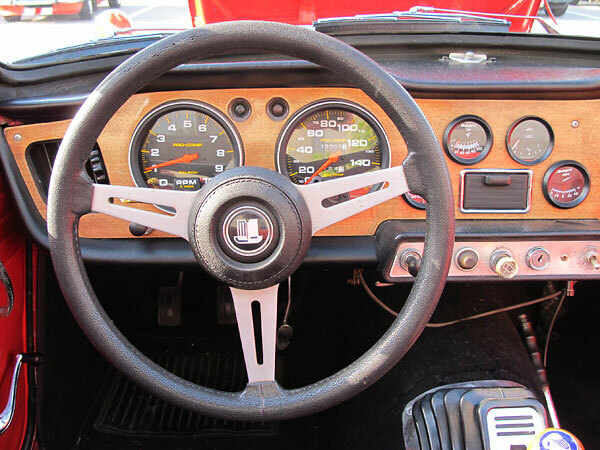 Steering wheel and gear shifter. 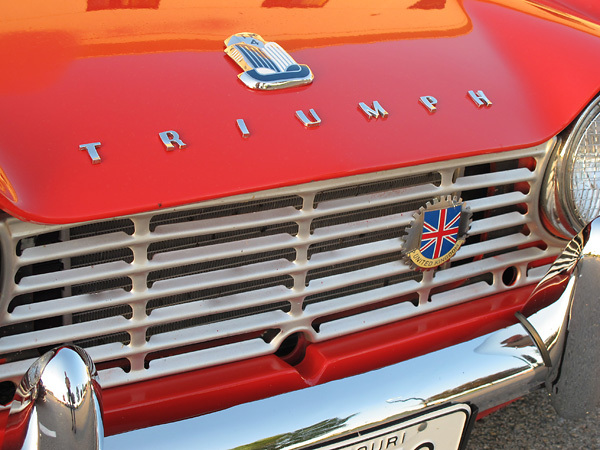 Photographed during BritishV8 2013, in Omaha Nebraska. 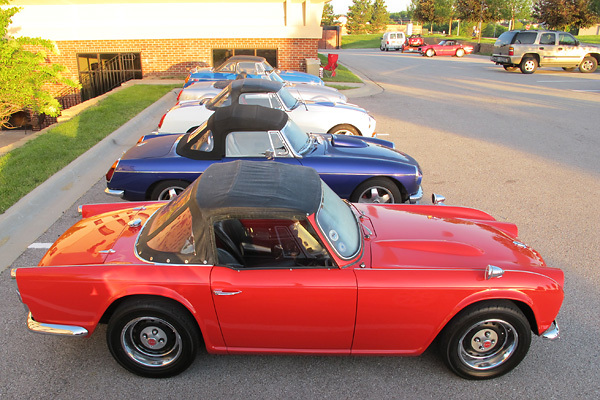 Early morning, with dew on the cars. 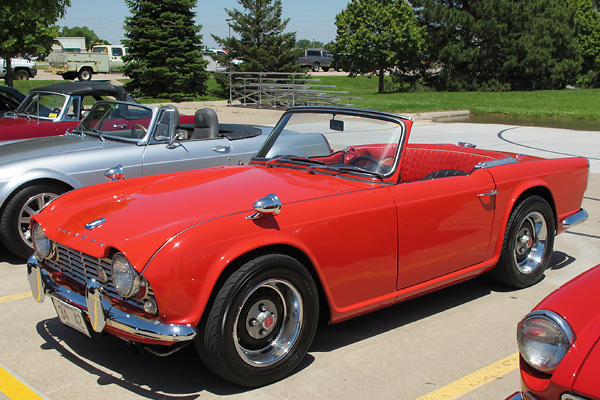 From the beginning, the Triumph TR4 model was designed around 15 inch wheels. Commission No. CT-19593-L. Gross laden weight. 1205kg. 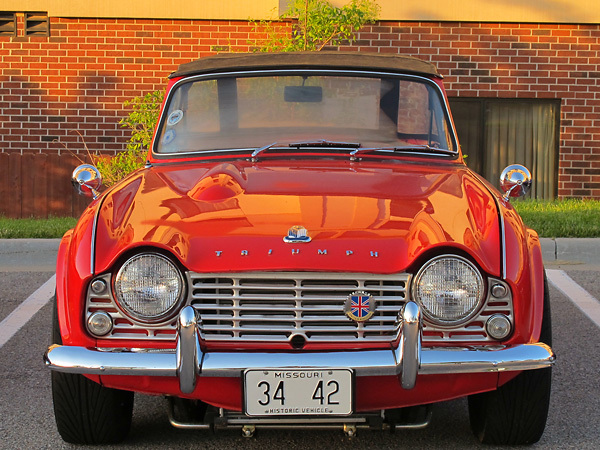 Manufactured by The Standard Motor Co. Ltd., Coventry, England. 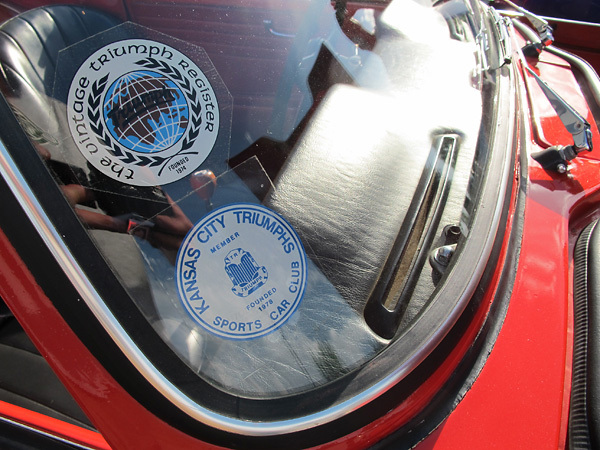 "Kansas City Triumphs Sports Car Club, Member, Founded 1978"
Triumph TR6 steel disc 15X6 wheels. 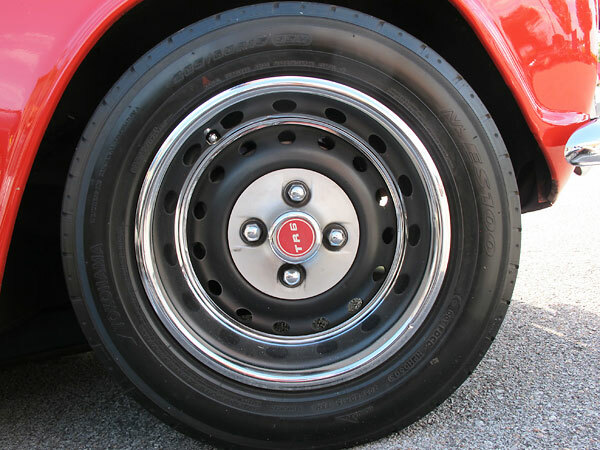 Yokohama AVS ES100 205/60R15 tires.